The voice inside my head was right, if you build it they will come. I’ve spent the last 60 school days trying to instill a love of reading and books with my 3rd graders. And a few stand out moments are shining through that I am thankful for. I got a tweet from a student the other day that she got a library card and took out her first book. I don’t care what age, finding the public library is a wonderful resource for any soon to be book lover. I was so happy she shared that experience with us, having her mom take the picture and tweet it to us. Also, our typical snack time consists of half the students sitting around my kidney bean table and talking, while the other half sits on the couch and chats. I usually find myself at the table, but last week when I looked over to the couch, I found one student gathering the children for a read aloud. She had the book Tek: The Modern Cave Boy by Patrick McDonnell in her hand and she was saying something like “I’m going to read it to you”. The students all stopped what they were doing and found a spot surrounding her to hear the words and see the pictures. Since I’ve started to take the time to go to the library and bookstores, follow people on twitter, blogs and other social media, it has changed how my students engage with books. The excitement I get when I find a true “hidden gem”, as co-blogger Courtney puts it, is such a thrill. I love sharing it with them and the children hear that passion as I read or book talk my latest discovery! Author StorymamasPosted on November 29, 2016 Categories Children's Books, Inspiration1 Comment on Sudden Impact…. There’s nothing an author likes to hear more than that someone enjoys her book. Please tell your son that this book is really a Chicago book—and I had trouble finding a publisher until I submitted to an editor outside of New York City. In Chicago we hear about trucks being stuck under viaducts pretty frequently. In NYC they call them “underpasses” and editors there questioned if a young child would understand the word Viaduct. Of course they do! It’s such a fun word! I live in Oak Park where the el tracks run right through town and there are quite a few viaducts which trucks must negotiate. I’ve seen stuck trucks numerous times and that’s how I first got the idea for this story. Truck Stuck will be coming out as a board book in Jan. and I hope to have a book release party at The Magic Tree Bookstore, in Oak Park, on Lake St. Perhaps you and your son can come to the Magic Tree and we might meet and I can sign his book. The day we got Sallie’s books in the mail of course J requested that night to read Truck Stuck and Peter’s Trucks. As we were reading Truck Stuck I told J the author wrote us back. You should’ve seen his smile, he was grinning from ear to ear and said, “WHAT?! She wrote us a letter!” I read him the letter and when we got the part about writing about the underpass he said, “wait underpants?! WHAT? !” (and yes he actually does use that much expression when he speaks). Through our laughter I explained to him what an underpass was and we looked at the picture together. For what it’s worth he did like the word ‘Viaduct’ much better than ‘underpass’. 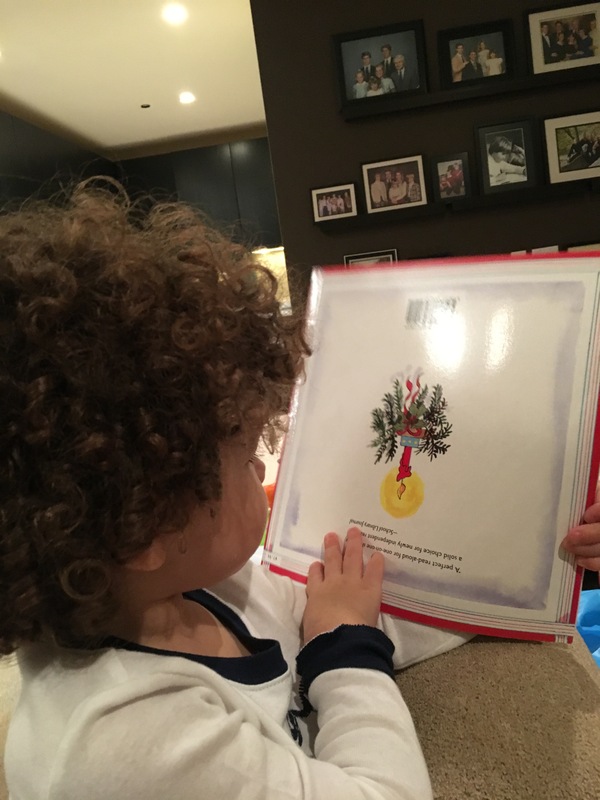 🙂 When I read to him the part about the book release party he said, “We can go right now?” I said, “no not until January.” Then J started singing the month song (since it starts with January). Oh the mind of a three-year-old is just so amazing! The next book we read that night was Sallie’s other book Peter’s Trucks. J said that he didn’t think it could be as good as Truck Stuck but as we read it he enjoyed it just as much and even made a connection to the concrete mixer that was in both books. I think it’s safe to say that both J and I have a new celebrity author crush! Neither of us can wait until the book release party to meet Sallie in person! Thanks for the invite! I have to say, I genuinely enjoyed reading “Book Scavenger”. Typically with kid lit, I have my students’ reading interests in the back of my min d, and I often read the story through the eyes of a third grader. Often I find both the characters and plot overly predictable. This was not the case in this debut novel by Jennifer Chambliss Bertman. Instead, the characters were well developed and the plot was believable. This novel follows the main character, Emily, as she recently moves to San Francisco and has to navigate not only a new town, but a new school and new peers, as well. She befriends James, the boy in the apartment upstairs, with a love of puzzles instantly bonding them. After discovering a book that was left in the BART station, they soon learn that the book is in fact a puzzle left behind by the creator of the infamous Book Scavenger, Garrison Griswold. It’s then that their adventures begin. The strong continues as Emily and James try to piece together the clues, while also navigating the ups and downs of their personal lives. “Book Scavenger” was a well-written adventure that kept me wanting to stay up late and read. I strongly recommend this book for intermediate classrooms, as it would appeal to a variety of readers. Just make sure you read it and enjoy it for yourself first! It had been a little while since I’d read kid lit. It had actually be a long while since I had read much of anything. Over the summer I was seven months pregnant, taking two classes for graduate credit, all while entertaining my third year old at the pool and around town. At the end of the day, I didn’t have energy for anything except brushing my teeth and going to bed, let alone reading a book. I went for long stretches of the summer not having a book to read for pleasure. My nightstand, which usually has stacks and stacks of books, was bare. Even my husband noticed and sounded the alarm. I didn’t have my nose stuck in a book. When school finally started up again in the fall and the draining heat of the summer began to subside, I scoured the shelves of my library and different websites, finding books that motivated me to rejoin the land of readers. All my reads happened to fall into the adult literature category, and even then, my reading was sparse. That all changed early one Saturday morning when Kim and I were on FaceTime. Clad in our pjs, I introduced her to my newest addition, she showed me some new toys, and then we got on the subject of books. Surprise, surprise. “You loved the Westing Game, didn’t you?” That led us into our discussion on new books and her recommendation of Book Scavenger. And now, thanks to Kim, I’m out of my rut and back on track. Happy reading, everyone! Cheers, where everybody knows your name. Who has or has longed for that place where you walk in and everyone does actually know you and your name? Well, I have that place, but it’s not a bar, it’s a children’s bookstore, called Second Start To The Right, in the city I live, Denver. I moved to this city over a year ago knowing not many people. I was told about this magical bookstore in Denver that I had to check out. I went the next week. I walked into the wonderfully name Second Star To The Right and I fell in love. The place is magical! It is a transformed house with a room dedicated to picture books, board books, and chapter books. Hidden throughout are comfy chairs and reading nooks. Most recently they’ve added an educational toy room and a Wild Rumpus Party room. I was immediately hooked as a mother and teacher. I go to Second Star so often I am friendly with most of the staff. The owner, Dea, and husband, Marc, have been so kind to me and my son over the last year. We’ve talked books, they let me run a book club for kids over the summer, and Marc also came to my school dressed as Cat in The Hat to read to the students for World Read Aloud Day! If you are ever in Denver you need to go to Second Star, but maybe if you can’t get to Denver, seek out other local bookstores. The feeling I get helping a small business is rewarding enough, but establishing a rapport makes it that much more worthwhile every time I visit. I checked my email a few weeks ago and I received an invitation to Second Star’s Friendsgiving. An event they created to invite their family, friends and favorite customers. They served food, had the kids run around their backyard and store after hours, and had crafts available for the kids. Declan and I went and had a blast, making new friends and chatting with old ones we’ve made this past year. To my Second Star Friends, I thank you for all you’ve done for me this year and look forward to our many magical years of friendship. Picture books have been one of my longtime love affairs since I was little. Ever since my mom, dad, brothers and sister would read to me as a child. I love everything about them: the colorful illustrations, the connections you have to the story, the humor, the patterns the words make, the interactive aspect and the fact that you can reread a picture book a million times and still enjoy it. As an adult I have found a new reason why I love picture books: seeing the book through my three year old’s eyes. To him the story is so much more than just the words; it’s the interactions he has with the book from the first time he reads it and then again and again as we read the book over and over. 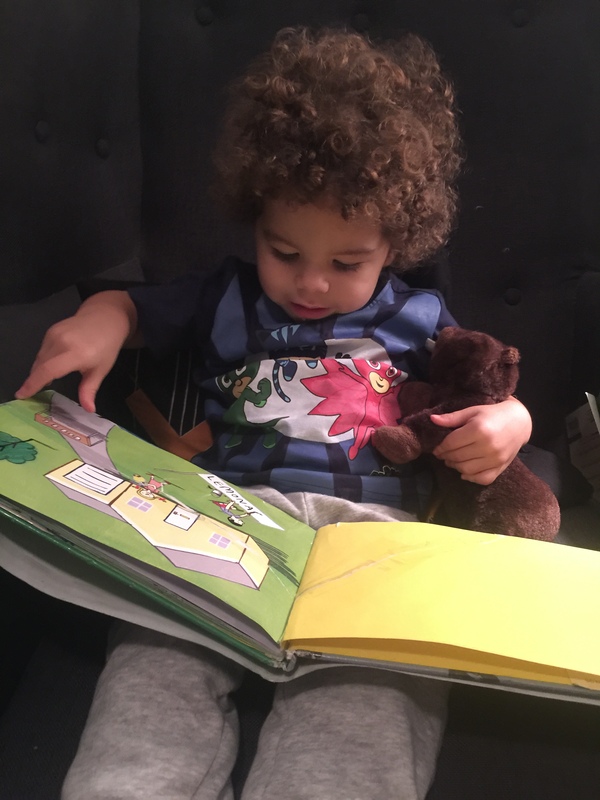 Seeing the story and pictures evolve through his eyes and watching his imagination grow as we read a book together is amazing. One of J’s new favorites is Truck Stuck by Sallie Wolf. This book is wonderfully written with a catchy tune we’ve made up to read it. It also has beautiful illustrations that catch your eye. Since we’ve read this book about 40 times now you would think we have seen it all on each of the pages. Well after reading it about 10 times J noticed that the driver of the truck was on a few other pages and got excited when we went back throughout the book to look for him. The next time we read the book he noticed the onomatopoeias “Beep!”, “Honk!” and he wanted to repeat them after me. After that he noticed the letters on the balloons in the picture and spelled out the word lemonade. Each time we read the book J noticed something new in the pictures and the words. Watching him experience the book and notice things that as an adult I didn’t notice puts a whole new perspective on reading a book. Maybe we all need to read a book through the eyes of a child. Maybe we will experience a book in a different way. Maybe all you need is to really sit with a child and let them read to you as much as you read to them. How has your child or students helped you to experience a book in a new way? 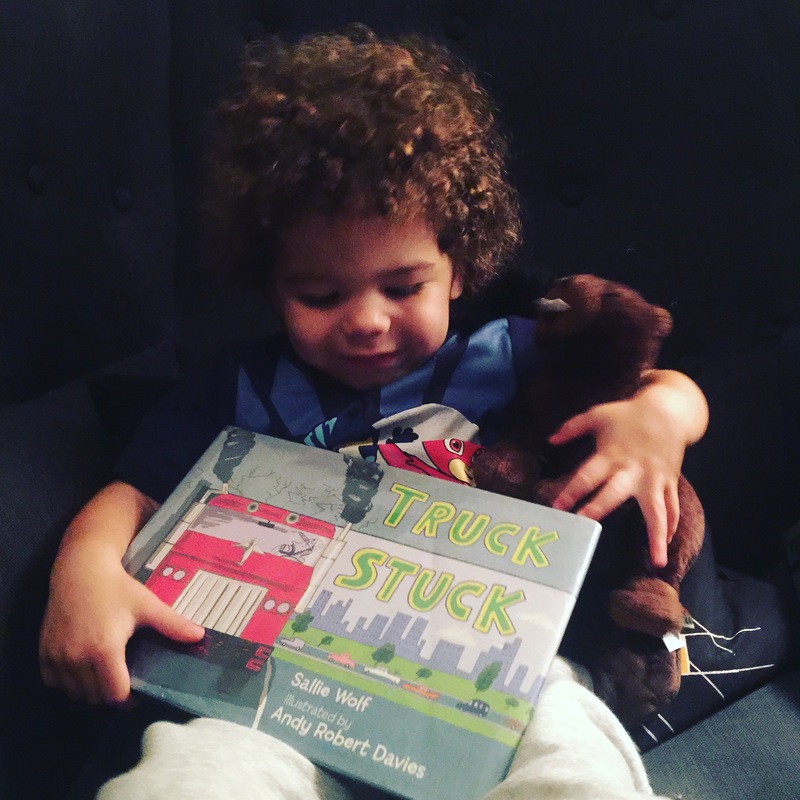 He couldn’t wait to take Truck Stuck to share with his friends in preschool! Reading Truck Stuck for the 100th time on his own. Bookstores are my happy place. Always have been, always will be. I fantasize about opening my own little bookstore when I retire from teaching, hoping that by then, books will not be obsolete. That in itself is a whole other post. Have you ever seen the movie You’ve Got Mail ? It’s cheesy, yes, but the local bookstore? Oh, how I long to have a shop around the corner. My town is lacking in a bookstore, but I don’t think I can quite convince my husband that I should be the solution. Bookstores have a smell. You all know that new book smell. The smell is still there when the Amazon box arrives with books for my classroom, but it’s not same. However, the joy of getting new crisps books will never go away. I recently had a baby and have been given many generous, generous gifts. My sister, who shares the same passion for reading and books, gave me an amazing “welcome to the world, baby” present. An Amazon box arrived with three books I’ve been wanting to read. I guess after 36 years, she knows me pretty well. Reading picture books is one of my favorite things to do. I can’t wait to read aloud to my students, I’d do it all day if I could. 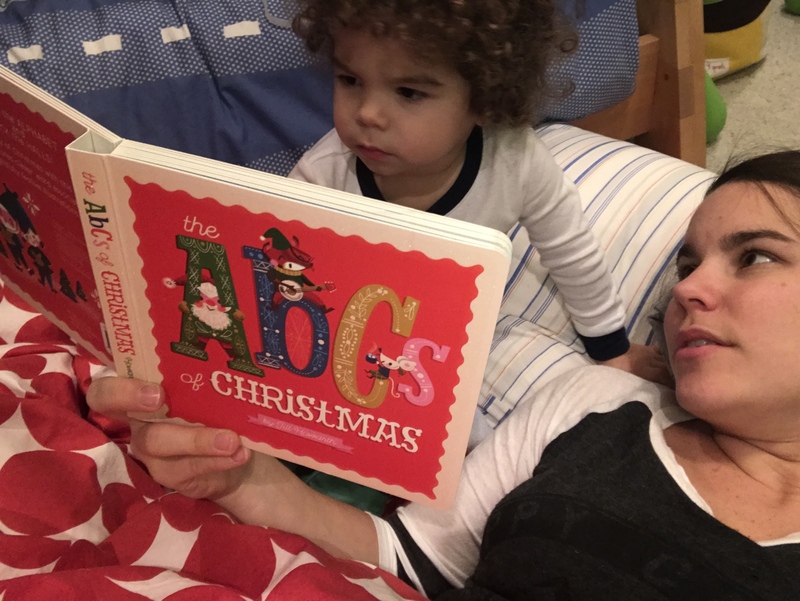 I cherish the times Declan brings me a book to read to him and he snuggles on my lap. I even had a period in college when I would read bedtime stories to my roommates. What college student didn’t want to hear Cloudy with A Chance of Meatballs?! But recently I’ve realized I read to my students and son so much I often don’t get the chance to listen to other people read books aloud. Now, as a parent, I get to hear another take on many of my favorite books, through the eyes of my husband, Chris. As he reads aloud I love to hear his interpretation on books I have read a million times. I use to read Goodnight Gorilla to my nieces and we’d laugh at the end when the wife wakes up. But listening to it read by my husband he started to point out the balloon on the pages, because that’s what Declan liked at the time. And sure enough did you know that in almost every page of that book there is a balloon?! I had no idea. While reading the Airport Book by Lisa Brown he discussed with Declan how many of the characters have their own stories through the illustrations, that the biker bikes to the airport and then bikes away once he has his bike back from the luggage carousel. I have to be honest I never saw it. So, my take away, even though reading aloud is my favorite, sometimes it’s is just nice to just sit back and see someone else do it and you might learn (or see) something new! My love of kid lit began as an undergraduate elementary education student during my very first introduction to children’s literature. My professor was amazing and ‘book talked’ at the beginning of each class to inspire us and develop a never ending love of books. Well it worked. I loved being a listener while she sang praises about the fantastically written and beautifully illustrated books she was sharing with us. After graduating my love for kid lit grew even more as I was getting ready to start my career as a second grade teacher. I was the newbie teacher spending copious amounts of money on new books. My husband couldn’t believe how much I was actually spending in my new career and sometimes there were words shared that weren’t as inspiring as my college professors. Throughout my years of teaching my love for books continued to grow. With Courtney I went to the International Reading Association Conference and we came away with new ideas to change our teaching and of course bags full of books. Kim and I started our journey together as “tech nerds” (a name we enthusiastically gave ourselves). We shared a love for technology and we began discussing how we could integrate technology in meaningful ways with our students. We added “book lovers” to our self-named title once we started sharing about books we were reading with our students. Throughout the years we shared our love of technology and books through constant conversations, presenting at various conferences, becoming life-long friends and eventually Kim and I had our baby boys almost exactly one year apart. 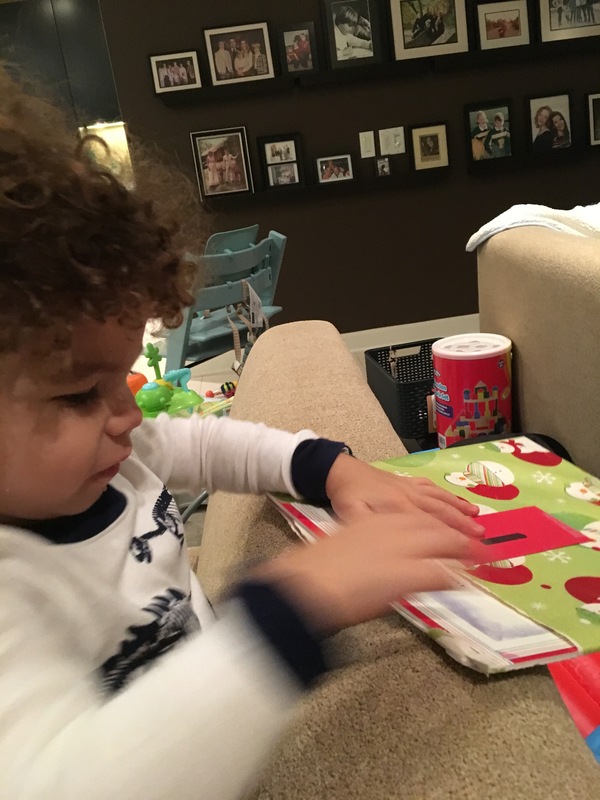 Soon after her son was born she began taking a picture a day of reading with her son and excitedly told me about her new hashtag #dsbookaday. I shared in her excitement and told her I was sad I didn’t start taking pictures beginning a year earlier of my son, but nonetheless I started taking pictures the next day with my own hashtag #jsbookaday. 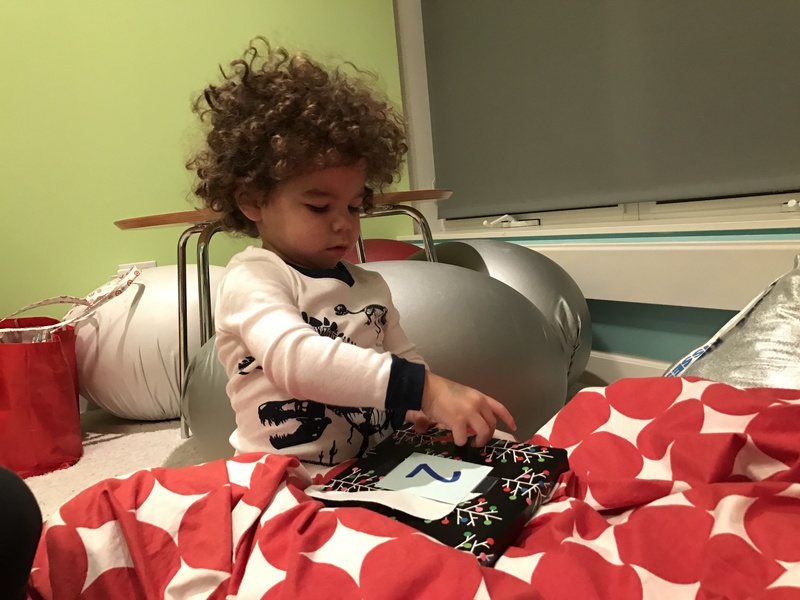 I now have two young boys, a three year old and a seven month old, who I share a love of children’s literature with and take pictures daily of our reading experiences. My husband, someone who didn’t read himself as a young child, has grown to love children’s books, maybe as much as me. He has so much fun reading books to our little guys and he now says to me, “we need more of ______ books!” and he has jumped on board taking pictures of me reading with our boys when I can’t or when the picture just looks better without the selfie view. I’d like to say that I am now much more frugal about spending money on books but actually nowadays I’m spending more money, more frequently. I can’t look at Twitter or Instagram without adding at least 5 books to my Amazon cart to later buy (while hopefully supporting a local bookstore). But it’s not about the money, it’s about the experiences, conversations and connections we have while reading. It is our book experiences that inspire discussions about friendship, love, math concepts, word knowledge, rhyming, diversity, creativity, art, inspiration, etc. with our three year old and seven month old. And what better way to teach a child about life than through amazing literature? 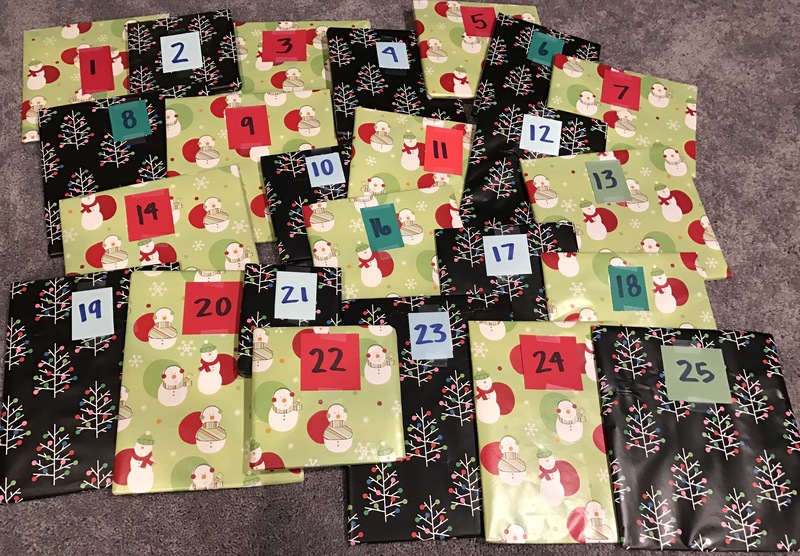 I am proud that my obsession with kid lit has had a huge impact on how my husband and my sons view reading and I hope this will only continue. My reason behind wanting to write this blog with two wonderful friends is to maybe bring you a bit of inspiration like my college professor did for me, send some new titles your way and share or make connections to your book experiences. One of our first family reading experiences. Reading Knuffle Bunny in the ball pit with some bunnies. Look at the joy on my husbands face while reading Elephant & Piggie at the Library.